With Adam Lambert back home (for another week anyway!) getting some rest and acquaintanted with his new Hollywood digs, The Backlot scored this interview talking about his AT&T Live Proud campaign and his just-finished North American tour with Queen. I’ll start the interview here and give the link for you to continue reading. Since his debut on American Idol, Adam Lambert has been a fixture on this site, and we’ve followed his life and career, through the peaks and valleys (mostly peaks, thankfully). Through it all, he’s kept his optimism and fiery inner strength, which is part of the reason why we fell in love with him. Adam took a few minutes out of his schedule to talk to us about the Queen tour, his advocacy, and especially the AT&T Live Proud Campaign. The Live Proud Campaign is a sweeps involving inspirational memes. Five winners will be selected for a trip to NYC for a private event with Adam. It ends on August 10th, so it’s not too late to enter for a once-in-a-lifetime chance to meet the man himself. TBL: Thank you so much for taking a few minutes for our readers. TBL: I wanted to start right off talking about the Live Proud Campaign. It ends in a few days, so it’s not too late for people to participate. I know a lot of our readers are familiar with it, but for those who aren’t, can you explain what it is? AL: Yeah! it’s a really cool empowerment campaign that encourages people to be who they are with pride, and to do it boldly. And what I love about it is it’s also a creative exercise. We’re asking people to come up with memes that express how they “live proud.” So I like that it it’s creative, and people can be very playful with it and have a good time with it. They can upload a picture and come up with a saying or slogan, and give their individuality a little … meme. We’re going to pick some winners and do a private event in New York, which should be really cool. TBL: I’ve seen some of the memes. Some of them are so creative. TBL: What would your meme be? AL: Oh Lord, don’t ask me that! I would have to put some thought into it. I haven’t thought about it yet. That’s a good question! TBL: I know you must get inundated with charity requests, but you’re only one man, so you have to pick and choose. Why was LiveProud so important to you? AL: I worked with the organization last year and we had a really good time. We did a little bit of a different project last year. We did a PSA, and they were so sweet, and we did an event at the end of that for another set of contest winners. The event was really awesome, it was a live set with my band, and I just liked the way they organized everything. And I like that they’re a mainstream organization that has taken the time to do something for the LGBT community. I think it’s a really cool move. TBL: How do you pick and choose? Is it usually something instinctive? Do you know right away? AL: Yeah, I think so. I always want to have something going in that realm, I think it’s really important. I’m a celebrity because of what I do, my talent, I think, that’s first and foremost, but as an out celebrity I have this great opportunity to try and influence people, or open their minds, or give them strength, in both the gay community or the mainstream straight community. I just think it’s exciting to be able to be in that position, and so I always try to have something going on, and yeah, I think if it feels right, I go with that one. TBL: Do you think enough LGBT artists do enough advocacy work for LGBT issues? AL: I think so. I think we need more LGBT artists, that’s what I’m hoping we’ve moved towards, and it looks like things are finally getting to the point where someone who is LGB or T is able to become a recognizable artist, and that’s a big step forward, so hopefully we’re more and more a part of the entertainment industry. Saw the Queen and Adam Lambert concert at Madison Square Garden. It was awesome! When is Adam going to release a new album? It’s long overdue! I would also love a professionally done live Queen + Adam album! If Brian & Roger want to do new music, I can’t imagine them wanting anyone but Adam to doing, especially with the phenomenal reviews they’ve had. But Adam still wants to be a solo artist. It’s not easy to do both. How much more world tour will they book? I’ve heard talk about the UK now, following Japan/Australia. When does Adam say no, or after I get my next album finished? I’m sure he wants to do both, but how much Queen is too much, where it won’t allow him to be thought of as a solo artist? Questions, questions, questions! I’m definitely very PROUD of Adam for all his charitable contributions he has invested into these last couple years! As a PROUD mother myself of my 20 years old Transgender daughter (male to female) who was thankfully confidant & strong enough to come out to society at the age of 15…I salute Adam & all the others that are helping to bring the LGBT community out of the dark ages!!! These folks are so misunderstood…all they really want is to be their true selves, be given some respect & the ability to live their lives as they are meant to be lived …& that is NOT behind closed doors! My family is NOT STEALTH about our daughters/our journey…we live “PROUD”. We assist other trans kids regularly & it is so gratifying to give to others any which way you can! This happens to be our destiny in this lifetime! We are very grateful she didn’t waste her life hiding from fear &her work giving back to others on the same roller coaster ride of life! Adam definitely is inspiring to so many people! 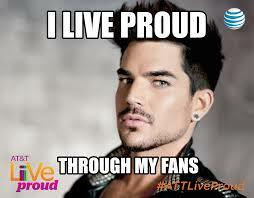 I have LOVED ADAM his since he belted out Bohemian Rhapsody in his Idol audition! I certainly feel that the LGBT community is in very good hands with such an AMAZING & Inspirational spokesperson as Mr. Adam Lambert! As for the Queen tour….Over the moon happy about its success & the exposure it allows Adam to showcase this rare & authentic talent! As for his new album…the anticipation…IS KILLING ME! I have all his music & listen daily. Bring it on Adam….CAN’T WAIT! I just can’t GET ENOUGH! He’s such a great interview-ee!! !